Today, we have another exclusive interview for the readers of the Roberts Report. This time it is with Edil Baisalov, the well known political figure and democracy activist from Kyrgyzstan. While only born in 1977, Edil has already established himself as one of the most important political figures in Kyrgyzstan and one of Central Asia’s most vocal activists for democracy. For several years, he led the country’s Coalition for Democracy and Civil Society, a coalition of NGOs promoting democracy and practicing election observation. His skill as an organizer of election observation missions was recognized in 2004 when he was chosen to lead an international observation mission of NGOs from Europe and Eurasia to the historic Ukrainian presidential elections that led to the Orange Revolution. Obviously inspired by the activism he witnessed in Ukraine, Baisalov returned to Kyrgyzstan to lead the Coalition’s election observation to the 2005 Kyrgyz parliamentary elections and to eventually play an influential role in the events following that election that led to that country’s Tulip Revolution. Since March 2005, however, Mr. Baisalov has not ceased his activism. He has been a key figure in the movement to hold President Bakiyev accountable for his promises of democratic reform and has been a voice of reason during the many protests that have taken place since Bakiyev became president. He has also paid a price for this activism. In April 2006, he was attacked by an unknown assailant, and he has been subjected to frequent smear campaigns accusing him of being a tool of the U.S. Recently, he left the fold of civil society organizing to join the Social Democratic Party led by Kyrgyzstan’s present Prime Minister Almazbek Atambayev and will be number 13 on the party’s list for the upcoming elections. Edil is representative of a new generation of political figures in Central Asia, and he is likely to continue to have significant influence on Kyrgyzstan’s political development. 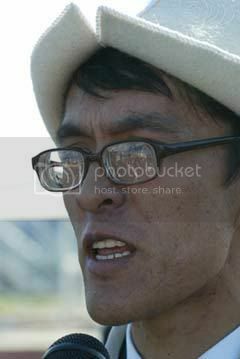 Furthermore, as a representative of Central Asia’s new generation, he is also a fellow blogger. As he prepares for Kyrgyzstan’s first full party-list parliamentary elections, I convinced him to spare some time to answer questions about his career path, Kyrgyzstan’s upcoming elections, and the U.S. agenda of promoting democracy in Central Asia. SR: You were very much involved in the March 2005 “Tulip Revolution.” Since 2005, many both inside and outside of Kyrgyzstan have lost enthusiasm for the revolution and believe that it has changed very little in the country. Do you the spirit of the “Tulip Revolution” is still alive in the country and can still lead to democratic reform? EB: The spirit is certainly alive and you hear references to March 24 in almost every political speech or article. That being said, there is clearly a sense of fatigue from the great upheaval we have had over the past two years. Without a doubt, there is a very clear disillusionment in Bakiev and his administration – everybody understands that he is no better than Akayev or may be even worse in certain respects. Nonetheless, the lessons of March 2005 still loom large and are a major political factor. I assure you that this is not my wishful thinking – people have not forgotten why March 2005 happened. What went wrong in March was that the events developed too quickly - nobody expected Akayev to flee in a matter of hours. There was really no time for a new social contract to be struck between the elites and the people. Even if there were a few pronouncements – they didn’t sink deeply enough in the national consciousness. So, yes, what was supposed to be a popular revolution prematurely ended with a coup d’etat. SR: You told me last year that it would take new parliamentary elections to begin realizing the next stage of democratic reform in Kyrgyzstan. What is your prognosis for how these upcoming elections will transform the political landscape of the country? EB: These elections are indeed very crucial for Kyrgyz democracy. The announcement of early elections has already brought about real changes: we are witnessing the consolidation of parties as the politicians put aside their personal ambitions and unite. Parties are engaged in serious grassroots activism, opening offices and talking to people. They have never done that before. These elections, however, are only a first step and, of course, it will take a few cycles before we adapt to the proportional electoral system. But now, we finally have a situation where political parties are more important, influential and resourceful than NGOs. You can’t build a stable and successful democracy without strong parties – so we’re very excited and hopeful. SR: You have been involved in election monitoring for years, and you know how past elections have been run in Kyrgyzstan. What will be the most critical issue in election implementation this time to ensure that these elections are as free and fair as possible? EB: I think the most serious issue will be around CEC. It is already not clear how the CEC is going to resolve the controversial dispute that has arisen around the 0.5% threshold required in every oblast. Otherwise, all political parties are going to appoint observers around the country and should be able to prevent any mass scale effort to falsify the results of the elections. SR: Before joining a political party, you were viewed by many as one of the leading personalities in Kyrgyzstan’s civil society. Has it been difficult adapting to the world of politicians? EB: Actually, it has been a very welcome relief to do away with the “foreign-paid” stigma with which I was tagged as an NGO leader – that really cost and hurt me dearly. But it is also difficult serving as a full-time secretary to a political party, especially when this party is chaired by the current prime minister, I have to think twice before I say anything publicly. I must now stick to the party-line and defend it publicly even when I don’t completely agree with it. It has also been sad to hear some people’s comments concerning my perceived change of heart and betrayal of democratic values or whatever. Unfortunately, politics in Kyrgyzstan have become so polarized that for many it has become an atmosphere of “you are either with us or against us.” I see that some people were clearly disappointed with me joining active politics – I can no longer take many of the moral positions on issues but always must be very pragmatic and diplomatic in promoting my party’s standing. I am not saying that there is no room for morality as a political party representative, but if in the NGO world we didn’t necessarily care about being popular and could afford to go against the prevailing public mood – such behavior is suicidal in politics. I still want to lead people to change their attitudes, but I must now be more sensitive and careful about how I approach this task. SR: How are the chances for your party in the upcoming elections? SR: Has the addition of Roza Otunbayeva to your party brought new supporters? SDPK positions itself as a very aggressive modernization party. Thus, Roza Isakovna’s decision to join was a great boost. Bakyt Beshimov’s return to us from Ak-Shumkar also spoke volumes about SDPK’s efforts to unite top intellectuals with global awareness. Our task is to promote pro-poor growth and build a competitive 21st century economy through the leadership of people like Otunbayeva and Beshimov. SR: In your opinion, which parties in Kyrgyzstan will gain seats in the new parliament? EB: At the moment, we estimate that only four parties will obtain seats: SDPK, Ak-Jol, Ata-Meken and the Communists all have good chances of making it to the next Jogorku Kenesh. Active campaigning, however, only begins on November 26 – thus, we’ve yet to see if any of the other parties can surprise us by making serious in-roads with the public. SR: On a slightly different topic, the Bush administration in the United States has done much (especially in the context of the Iraq conflict) to tarnish the concept of promoting democracy around the world. How has this phenomenon affected attitudes in Kyrgyzstan both towards the ideals of democracy and with regards to the U.S. more generally? EB: I can’t even begin to describe how dramatically the situation changed. While we always have had a certain degree of anti-American propaganda and mistrust of the good intentions of Uncle Sam (after all, we are a former Soviet republic) – the debacle in Iraq and elsewhere is going to haunt both U.S. policy and democracy in the region for decades to come. The world has become very small, and it is not even just about Abu-Graib and other scandals in Iraq. You would be very surprised how deeply the Kyrgyz and others have become aware of the anti-democratic nature of the Patriot Act or the dubious legality of holding people without official changes in Guantanamo. Of course, the changes we clearly feel in Central Asia are not only due to American mistakes and miscalculations – even without them there would still be the factor of the rising power of other major players in the region who provide an alternative ideal of political development. But at the moment, there is a perception that America is discredited, distracted and weak in the region. This situation is certainly not helpful for the cause of democracy in Kyrgyzstan or elsewhere in Central Asia. I really hope that there will be more interest in our elections.